Thank you for choosing Clare Controls. In today’s competitive market place, we can appreciate that you have many choices for your home automation needs. This document is intended as a quick-start guide, not a full product guide. For more information, view the full ClareVision Plus Camera User Guide (DOC ID 1430). Note: Ensure all accessories are included. If not, contact your dealer. Option 1 requires access to the ClareVision Plus app, camera, and a PoE power supply. 1. Connect the camera to the PoE port on the PoE injector. 2. 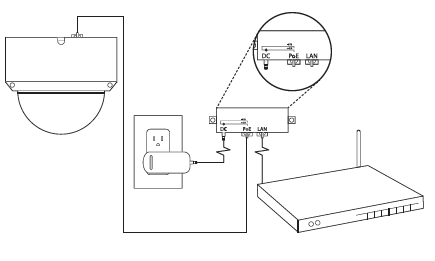 Connect the injector to the router, and then plug in the injector’s power supply. 3. Download and launch the ClareVision Plus app. Option 2 requires access to Wi-Fi, the ClareVision Plus app, and the camera. Note: When using the Wi-Fi option, ensure that your mobile device is connected to the desired network for the camera. 1. Connect the camera to the power supply. 2. Connect your mobile device to the Wi-Fi network desired for camera use (2.4Ghz only). 3. Add the camera in the ClareVision Plus app, see “To add a ClareVision Plus camera”. To access the live camera view and stream footage from anywhere in the world, you must set up a ClareVision Plus account. 1. Download and install the ClareVision Plus app. 2. Launch the app, and then tap My Devices. 4. Enter the homeowner’s credentials. Tap Register. Follow the registration steps below. Note: The ClareVision Plus account used must be that of the homeowner. a. Tap Mobile or Email (preferred), and then read and select the checkbox for the Terms of Service. b. 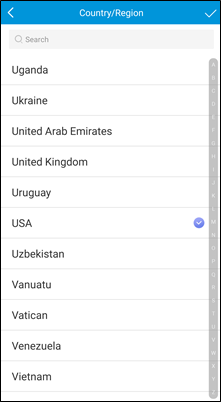 Select the country, and then tap Finish in the top-right. c. Enter your preferred username and password, confirm the password, and then tap Finish. Note: the username cannot contain spaces. 2. Launch the app, select your country/region, and then tap the Checkmark icon in the top-right corner. 3. Tap Login, and then tap Register. b. 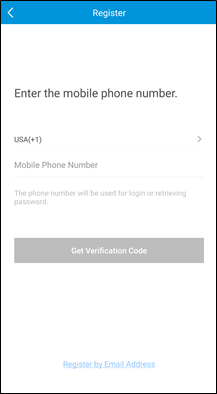 The Mobile Phone Number option is selected by default. Enter the mobile device’s number. Tap Register by Email Address at the bottom of the screen, and then enter your email address. c. Tap Get Verification Code. A verification code is sent to the email/phone. d. Check the SMS or email message for the verification code, copy the code, and then return to the ClareVision Plus app. 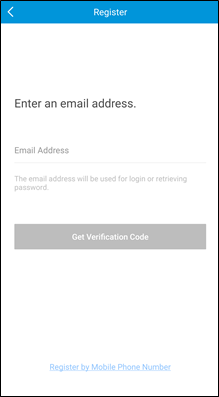 e. Enter the verification code into the field, and then tap Next. 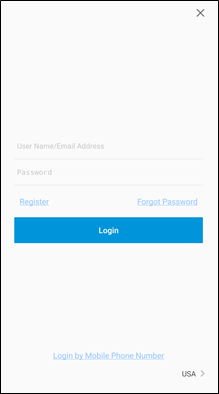 f. Enter your preferred username and password, confirm the password, and then tap Finish. 4. Tap Login, and then enter your set credentials. Note: Android users with a device that supports fingerprint authentication are presented with a fingerprint authentication pop-up. If desired enable the fingerprint usage. The CVP Account Management settings display. b. 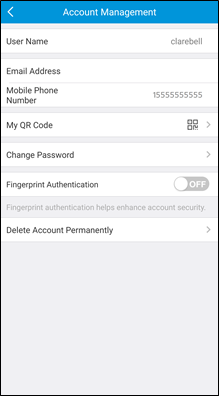 Tap the Fingerprint Authentication slider to enable the feature. 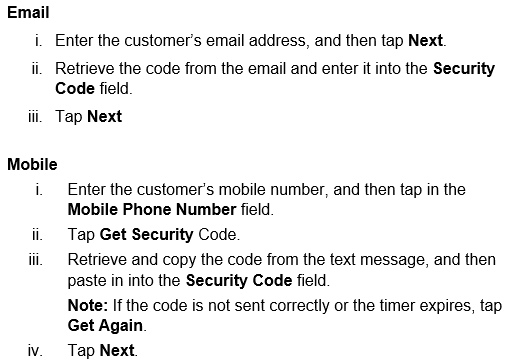 c. Follow the displayed instructions, pressing the desired finger over the fingerprint reader on the mobile device. Note: Once finished, Fingerprint Authentication is required to access the app. 5. Add your CVP cameras. 1. Launch the ClareVision Plus app. 2. Tap My Devices, and then tap the Plus icon. 3. Scan the QR code on the camera housing or the packaging label. 4. Follow the instructions in the ClareVision Plus app to complete the process. You must have an NVR or a micro SD card to record footage. ClareVision Plus micro SD cards come pre-formatted for ClareVision Plus cameras. Other micro SD cards require formatting before use. 1. Tap the Cloud icon. 2. Tap Recorded footage icon. 4. Select the camera(s) to search for recorded footage. 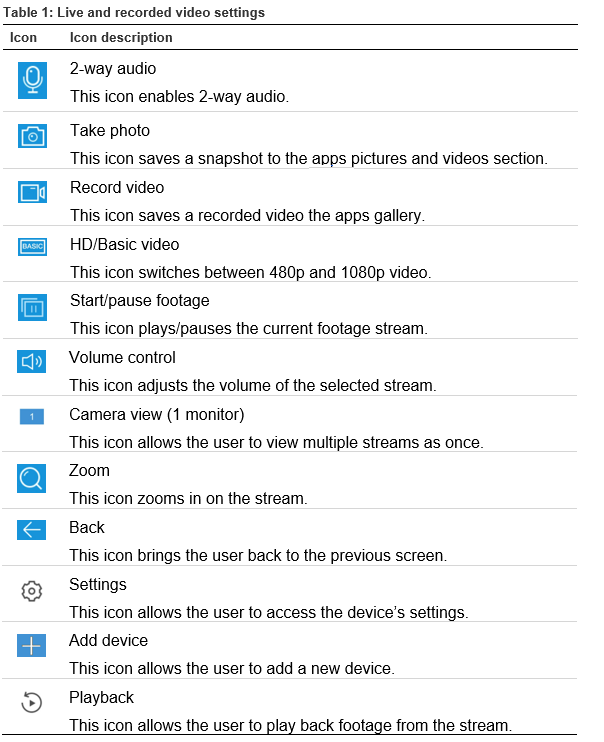 The below icon guide helps navigate and configure settings in the ClareVision Plus app. Clare Controls offers a three (3) year limited warranty on original Clare Controls components, from the date of shipment form Clare Controls. To view complete limited warranty details, including limitations and exclusions, see www.clarecontrols.com/warranty.